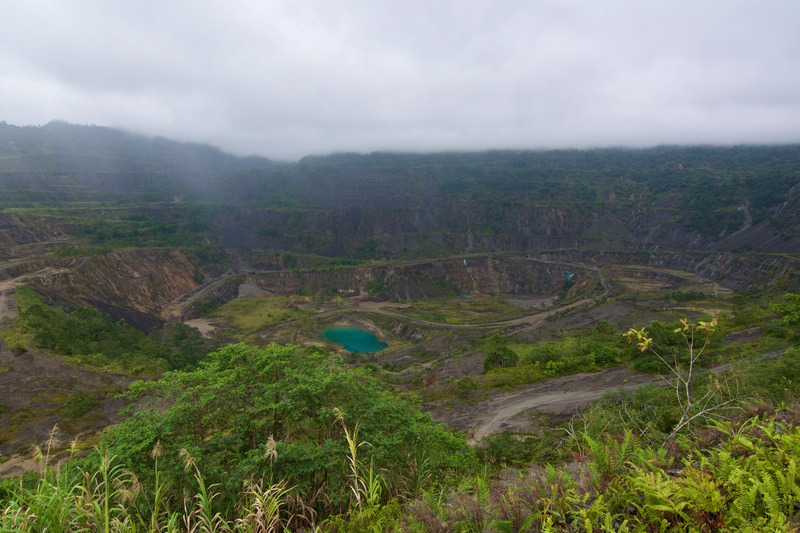 From 12 August to 25 August 2015 PaCSIA directors Dr Volker Boege and Mr Serge Loode conducted a scoping and planning visit to Bougainville for the PaCSIA project ‘Building Capacity in Governance among community leaders in the Panguna Mine area, Bougainville’ – the Panguna Dialogue Project (PDP). The aim of the visit was to prepare a series of dialogue workshops which will be held in later project stages. During the visit a vast variety of stakeholders were met and informed about the project, and their endorsement and support was ensured. In particular, meetings were held with the Vice-President of the Autonomous Bougainville Government (ABG), Patrick Nisira, who is at the same time ABG Minister for Referendum, Peace, Weapons Disposal and Veterans Affairs, with the Catholic Bishop of the Diocese of Bougainville, Bishop Bernard Unabali, and the three ABG members from the constituencies which cover the project area: Dennis Lokonai, member for Bolave constituency (at the same time ABG minister for health), Michael Lapolela, member for Ioro constituency, and Clarence Dency, member for Eivo-Torau constituency. They all are in full support of PDP. The main event of the visit was a Planning Workshop which was attended by more than 80 community leaders from the project region – chairmen and members of Councils of Elders, chiefs, church, women and youth leaders. The workshop took place on 21 August 2015 at Siimalaka Four Square Gospel Church Hall in the Bolave Constituency of Bana District, downstream of the Panguna mine. During the workshop the community leaders identified problems and challenges in the fields of peacebuilding, governance and dispute resolution that their communities are struggling with and which they want to have addressed in PDP community dialogue workshops. They also started planning of the workshops. A delegation of the Panguna Meekamui under the leadership of Commander Moses Pipiro participated in the Planning Workshop. This is of major importance as the project area is a Meekamui stronghold, and one of PDP’s aims is to get the Meekamui movement, which has not yet fully joined the peace process, involved in grassroots peacebuilding work. 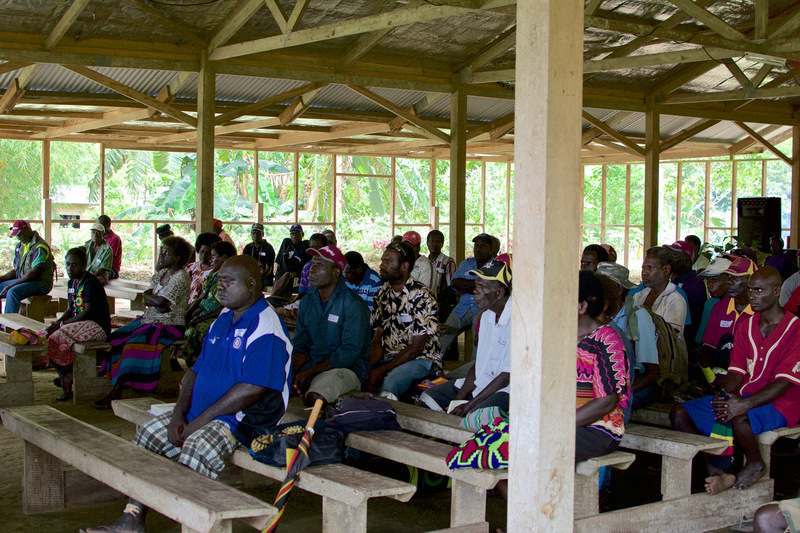 Also in attendance at the workshop were the Catholic Bishop Bernard Unabali, the three ABG members for Bolave, Ioro and Eivo-Torau, the ABG Member for Central Bougainville Women Marcelline Kokiai, and Head of the ABG Department for Referendum, Peace, Weapons Disposal and Veterans Affairs, James Tanis. The Planning Workshop adopted a Memorandum of Commitment regarding the future work of PDP. This ‘Panguna Stakeholders Bolave Commitment’ was signed by more than 20 representatives of the Council of Elders areas present at the workshop, as well as by the three local ABG members and Commander Moses Pipiro, witnessed by James Tanis and Marcelline Kokiai. The workshop participants also endorsed the members of a project Steering Group and the local Facilitators Group. The Steering Group which was established during the planning visit includes the three ABG members from the project area, the Panguna Meekamui Commander Moses Pipiro, one representative each for women, youth and church from the project area, plus James Tanis as Head of the ABG Department for Referendum, Peace, Weapons Disposal and Veterans Affairs, and Volker Boege for PaCSIA. A local Facilitator Group was also formed. The group had a half-day training workshop and another half-day meeting for de-briefing of the community Planning Workshop and for planning of future work. The team of local facilitators comprises of men and women, of young and more experienced people, some of whom already have been involved in facilitation and mediation work before. It is particularly significant that two of the facilitators come from the Meekamui movement. Lead facilitator is Dennis Kuiai, who is also the new Bougainville PDP coordinator and head of the PDP Bougainville office. He succeeds James Tanis in this role as James has taken on a new position as the Acting Head of the newly formed Department for Referendum, Peace, Weapons Disposal and Veterans Affairs in the ABG. In this position James will continue to work with PDP. He and his department have already provided valuable support for the project. The Planning Workshop, the meetings with the local facilitators, the establishment of the Steering Group and the meetings with a wide range of stakeholders were extremely useful, in particular for building relationships, embedding the project in the local grassroots context and securing the pro-active participation of communities. 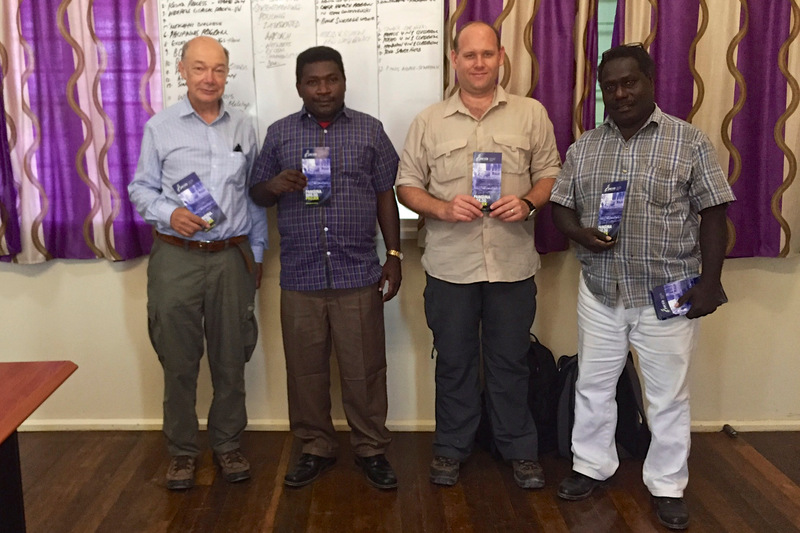 Volker Boege, Serge Loode and PaCSIA’s Erica Rose Jeffrey will go back to Bougainville for four weeks in October for a first round of PDP workshops.